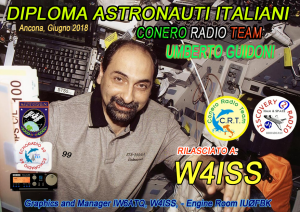 Begin 2018, June the first it’s an award dedicated to the most seven important italian astronauts, you can see the rules in italian, english and spanish. For C.R.T. FANs MEMBERSHIP an special award, after 4 points only. You have to request at 2016@crt.red Have funny with ITALIAN ASTRONAUTS AWARD till december 2018. Look at the cluster…..